Each week or each month as the information is available, this will be the page where you can access updates on the process of selecting a new priest for our Mission Church. So here goes….. Regarding A Priest: Ann Fleming, Missioner for Transition Ministry, and the Bishop will work together to recruit a priest they believe would be a good fit for St. Brigit. Once they have at least one candidate to move forward, the Bishop’s Committee Community (BCC) will interview that candidate to either confirm or disconfirm that appointment. If the appointment is confirmed, the BCC, the priest and the Office of the Bishop will work together to write a Letter of Agreement. In the meantime: While we work to complete our profile and other materials that define who we are and what we need in a new priest, we will using supply priests and an interim priest may be appointed. Interim Priest: If an interim is appointed, s/he is also only appointed after the BCC has had an opportunity to meet and interview the interim priest. The Office of the Bishop does not ever randomly assign or appoint clergy without the confirmation and agreement of the leadership of the congregation. Clarification: The Bishop and Ann Fleming find and vet the candidates, then the BCC either confirms or disconfirms the candidates. There are two Wardens on the BCC: Bishop’s Warden ( also known as the Senior Warden) Peg Nelson and the People’s Warden (also known as the Junior Warden), Susan Kirmaier. While the Treasurer is not designated a Warden, he is integral to the operation of the BCC and the church in times of transition. Your BCC Treasurer is Paul Kelly. “In the absence of a vicar(rector) or interim pastor, the wardens are canonically responsible for the worship, finance, property and administration of the mission (parish).” At our upcoming BCC meeting, we will be clarifying these roles as they impact the wardens. Part of the process in finding an interim Priest and replacement Vicar is to develop two documents that will help us find the right match between our needs and the capabilities/interest of potential replacements. A team has been formed to answer 12 specific questions required by the Diocese. The team will address 3 questions per week and expects to have the questionnaire completed by the end of May. This gets posted nationally as part of the search. In addition, materials will be gathered to develop a profile of our worship community that tells the story as we want to tell it and provides information to prospective Vicars about who we are and what is important to us. This will likely be completed in July. Although it has only been two weeks when we heard from Felicia that she would be leaving in May, two areas are already in process. Supply Priests: Deacon Bookie has a list of supply priests and has some replies already for May and June. She is expanding the list to include July. Deacon Bookie is the point person for supply priests. Duties of Supply Priest: A Supply Priest has the responsibility for the Sunday service only. This person will not be here during the week and will not be available to serve in any other capacity than the Sunday service. They are paid a per diem for their work and there is money in the budget for supply priests. If for some reason, we need a supply priest beyond the current budget for supply, we have a reserve fund which we feel will cover the cost. Pastoral Care: Deacon Bookie will lead a newly formed Pastoral Care Team which will include members of the Healing Prayer Community. Deacon Bookie is also talking with a priest she is requesting to be available in a situation where the Pastoral Care Team needs support or direct contact with a parishioner or a parishioners family. There will be more information about this in the coming weeks. Several people have asked about the responsibility of the BCC in the process of supply priest, interim priest and a priest called to lead the congregation of St. Brigit Episcopal Church. 1. St. Brigit is a MISSION and not a PARISH. There are some similarities and some differences in the process for choosing an interim priest and a priest to lead thecongregation forward. One difference is there is not a search committee in a Mission. 2. The biggest difference is the role of the BCC. The Episcopal Church is NOT a democracy . The BCC is the group that has the interface with Ann Fleming and the Diocese. With a new Bishop ( Bishop Kym) coming into the Diocese at the same time we are in transition ourselves, we are anticipating that there will be some confusion and delays but our prayer is that all will go as smoothly as it possibly can. Please hold your BCC members in prayer as they will be holding a great deal of this confusion and working through it themselves. The Bishop makes the final decision on a priest. The BCC is tasked with two decisions – a) to recommend a person to be the priest at St.Brigit. The Bishop makes the decision whom to call to be our priest. b) to accept or reject an interim priest brought forward by the Diocese ( Ann Fleming). If the BCC rejects the interim recommended to us, we will then be sent another person..one at a time. The only way to do this is to be as TRANSPARENT as we can be given confidentiality and personnel legal matters. 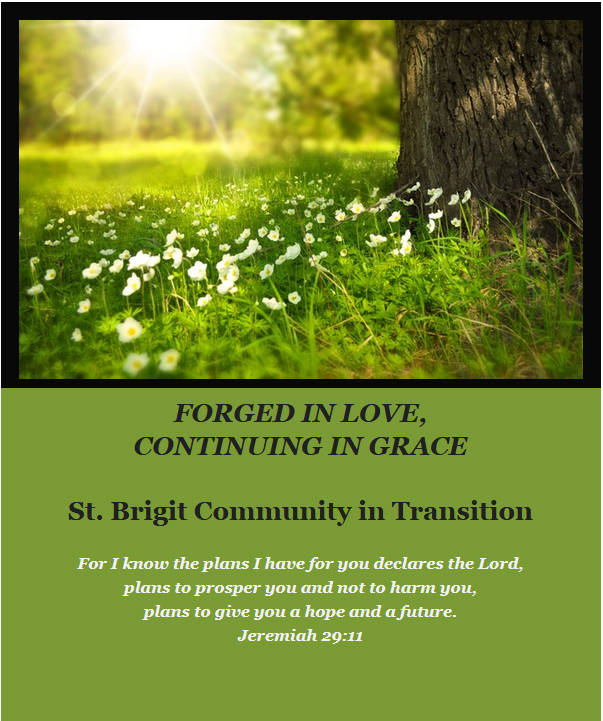 In order to promote transparency, we MUST have participation from the people of St. Brigit.